Astro-Vision's Sinhala Horoscope Software is the preferred software among famous Sri Lankan Astrologers for over a decade now. Our Sinhala Horoscope Software is widely accepted both in Sri Lanka and abroad. Our Sinhala Horoscope Software provides accurate and precise calculations. Our astrology software takes care of calculating the astrological values giving you the freedom to focus on astrological analysis. The horoscope charts are customised keeping the Sri Lankan system of Sinhala Astrology in mind. Astro-Vision's AstroPack 1.0 Sinhala Horoscope Software provides various ayanamsa settings such as Chitra Paksha ayanamsa or lahiri ayanamsa, raman ayanamsa, krishnamurthy ayanamsa, thirukanitham ayanamsa. You can define your own settings for ayanamsa. 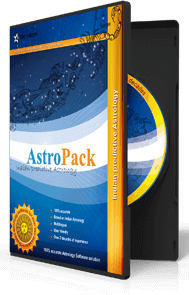 Astro-Vision AstroPack 1.0 Horoscope Software also provides you a choice of chart formats, like, Sri Lankan, South Indian, North Indian, Bengali and Kerala chart styles. So you can prepare charts based on your client’s preference. Unlike other astrology programs, Astro-Vision AstroPack 1.0 Sinhala Horoscope Software gives you the option to customise the Horoscope reports as required; e.g., as a single-page horoscope report, horoscope report with charts and calculations, etc. 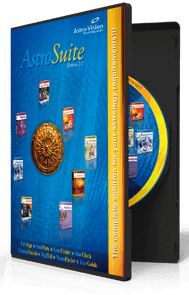 You can even choose from the templates available in Astro-Vision AstroPack 1.0 Sinhala Horoscope Software. What’s more, you can take a print out of the generated horoscope in Sinhala or English. Astro-Vision's Sinhala Astrology software has the complete set of calculations required for astrological analysis and astrology consultancy. 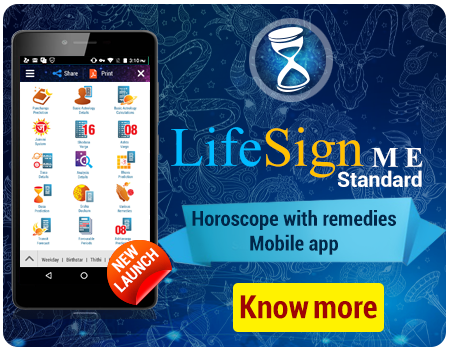 If you are looking for a Sinhala Horoscope Software which includes calculations as well as predictions, check out Astro-Vision LifeSign Astrology Software with predictions. AstroPack 1.0 Sinhala Astrology Software has a large database of cities around the world. So you don’t need to key in latitude, longitude and time zones every time. You also have an option to add new cities or places. Bhava Bala can be selected by two options in this Indian Horoscope Software – first is the nature of mercury determined by association, the other is mercury being benefic, irrespective of association. As a special offer, our Sinhala Horoscope Software comes with a FREE edition of our extremely popular Panchang Software, StarClock VX! Some exclusive features of the Panchang Software include dual language mode i.e., reports can be taken in English as well as in one regional language of your choice , representation of qualities of the planets, astrological qualities of the moment, exact rahu kala, gulika kala, software to identify transit times and transit positions, muhurtham software and Panchang Calendar. AstroPack 1.0 Sinhala Astrology Software calculates Birth Star as well as other astrological properties of the nakshatra and horoscope such as Star pada, Birth rasi and the rasi lord, Lagna Ascendant and the Lagna lord, Thithi (Lunar day) and various other calculated values. The longitude of planets including that of Uranus, Neptune and Pluto are given as per Western method of calculation. The nirayana longitude of the planets, the rasi, the longitude in the rasi, the nakshatra and the star pada is calculated. The Nakshatra, nakshatra adipathi, sub lord and sub sub lord is calculated for each planet. A brief summary of the nirayana longitude of the planets is also provided along with the rasi chart and navamsa chart in the Sinhala Astrology Software. The dasa as well as dasa balance at birth is also provided along with the rasi chart and navamsa chart. AstroPack 1.0 Sinhala Horoscope software provides the bhava chart as well as the bhava table with details of the arambha, madhya, antya and the list of planets located in bhava. Corresponding to each planet, a sub-planet ( Upagraha ) is calculated by our horoscope software. The sub planets of Moon, Venus, Mars, Rahu and Ketu are based on the longitude of the Sun and these values are also calculated. The dhumadi group of sub Planets is provided in a table with details of the method of calculation for each of these sub planets. The Upagraha longitudes are calculated and presented in table format for easy reference. The Nakshatra adipathi / sub-Lord / sub-sub-Lord Charts of Upagrahas are also prepared and presented. Upagraha rasi chart is calculated and prepared. AstroPack 1.0 Sinhala Horoscope software calculates the values corresponding to the Aruda chakra and prepares the chart. AstroPack 1.0 Sinhala Horoscope software calculates the values present in the shodasavarga table and prepares the table. AstroPack 1.0 Sinhala Horoscope software calculates the Lords of the shodasavarga and presents it in a chart format for easy reference. AstroPack 1.0 Sinhala Astrology Software calculates the varga bheda values wherein points are allocated for Swavarga (own house) and Uchavarga (exaltation). The corresponding Varga bheda table is also prepared. AstroPack 1.0 Sinhala Astrology Software prepares various charts after making necessary calculations such as the Rasi chart, Hora chart, Drekkana chart, Chathurthamsam chart, Saptamsam chart, Navamsa chart, Dasamsam chart, Dwadasamsam chart, Shodasamsam chart, Vimsamsam chart, Chathurvimsamsam chart, Bhamsam chart, Trimsamsam chart, Khavedamsam chart, Akshavedamsam chart and Shashtiamsam chart. Various Ashtakavarga charts are also prepared. Which makes it the ultimate Professional Sinhala Astrology Software. A brief summary of Vimshottari Dasa periods is provided in the Sinhala astrology program. AstroPack 1.0 Sinhala Astrology Software also has details of the Dasa and Bhukti (Apahara) periods along with details of the arambha and antya for each Bhukti (Apahara) within each Dasa period. AstroPack 1.0 Sinhala Horoscope Software presents the details of the Paryanthardasa within each Bhukti (Apahara) including the arambha and antya for each Paryanthardasa. An analysis of the planetary disposition including Lords of Houses, the Bhava lord of each house, Planetary conjunction (yoga), Planet to planet aspects, Planet to house aspects, Benefic Planets and Malefic planets and their effects, Friendship Charts including Permanent (Naisargika) Friendship Chart, Temporary (Tatkalika) Friendship Chart, Five-Fold (Panchda) Friendship Chart , Aspect Strength Chart (Drikbala) in Shashtiamsas, Shadbala Table, Bhava Aspect Strength Chart (Bhava Drikbala) in Shashtiamsas, Bhava Bala Table, Kuja Dosha Check, Moudhyam (combustion), Graha Yuddha (Planetary war) and Grahavastha is presented in AstroPack 1.0 Sinhala Astrology Software. ඇස්ට්රො-විෂන් සිංහල ජන්මපත්ර මෘදුකාංගය, සුප්රකට ශ්රී ලාංකීක ජ්යෝතිෂවේදීන් විසින් දස අවුරුද්දකටත් වඩා වැඩි කාලයක් තිස්සේ තෝරාගනු ලැබූ මෘදුකාංගයයි. අපගේ සිංහල ජන්මපත්ර මෘදුකාංගය ශ්රී ලංකාවේ මෙන්ම විදේශ වලද බහුලව පිළිගත් මෘදුකාංගයකි. අපගේ සිංහල ජන්මපත්ර මෘදුකාංගය නිරවද්ය සහ නිශ්චිත ගණනය කිරීම් සපයයි. නක්ෂත්ර විශ්ලේෂණ කෙරෙහි අවධානය යොමු කිරීමට ඔබට නිදහස ලබා දෙමින් එය නක්ෂත්ර අගයන් ගණනය කිරීම පිළිබඳ සම්පූර්ණයෙන් වග බලා ගනී. සිංහල ජ්යෝතිර් විද්යාවේ ශ්රී ලාංකික ක්රමයන් සිහි තබා ගනිමින් ඊට සරිලන සේ නක්ෂත්ර වගු හැඩගස්වා ඇත. ඇස්ට්රො-විෂන් හි ඇස්ට්රොපැක් 1.0 සිංහල ජන්මපත්ර මෘදුකාංගය මගින් චිත්ර පක්ෂ ආයානම්ස හෝ ලහිරි ආයානම්ස, රාමන් ආයානම්ස, ක්රිෂ්ණමූර්ති ආයානම්ස, තිරුකනිතම් ආයානම්ස වැනි විවිධ ආයානම්ස සැකසුම් ලබා දෙයි. ආයානම්ස සඳහා ඔබේම සැකසුම් නියම කළ හැකිය. ඇස්ට්රො-විෂන් ඇස්ට්රොපැක් 1.0 සිංහල ජන්මපත්ර මෘදුකාංගය මගින් ශ්රී ලාංකික, දකුණු ඉන්දියානු, උතුරු ඉන්දියානු, බෙංගාලි සහ කේරල වේලාපත්කඩ රටාවන් වැනි තෝරා ගත හැකි ජන්මපත්ර ආකෘතියන් ද ලබා දෙයි. එනිසා ඔබේ සේවාදායකයාගේ කැමැත්ත මත පදනම්ව ඔබට වේලාපත්කඩ සකස් කළ හැකිය. වෙනත් ජ්යෝතිෂ්ය වැඩසටහන් මෙන් නොව, ඇස්ට්රො-විෂන් හි ඇස්ට්රොපැක් 1.0 සිංහල ජන්මපත්ර මෘදුකාංගය මගින් අවශ්ය පරිදි ජන්මපත්ර සැකසීමේ විකල්පය ලබා දෙයි; නිදසුනක් වශයෙන් තනි-පිටුවේ ජන්මපත්ර වාර්තාවක්, වගු සහ ගණනය කිරීම් සහිත ජන්මපත්ර වාර්තාවක් ආදිය ලෙස. ඇස්ට්රො-විෂන් හි ඇස්ට්රොපැක් 1.0 සිංහල ජන්මපත්ර මෘදුකාංගය තුළින් ලබා ගත හැකි ආකෘති වුව ද ඔබට තෝරා ගත හැකිය. තවද ජනනය කරන ලද වේලාපත්කඩයේ ඉංග්රීසියෙන් හෝ සිංහලෙන් මුද්රිත පිටපතක් ද ලබා ගත හැකිය. ජ්යෝතිෂ්ය විශ්ලේෂණය සහ ජ්යෝතිෂ්ය විශේෂඥ උපදෙස් ලබා ගැනීම සඳහා අවශ්ය සම්පූර්ණ ගණනය කිරීම් කට්ටලය ඇස්ට්රො-විෂන් හි සිංහල ජ්යෝතිෂ්ය මෘදුකාංගය තුළ ඇත. ගණනය කිරීම් මෙන්ම අනාවැකි ඇතුළත් සිංහල ජන්මපත්ර මෘදුකාංගයක් ඔබ සොයන්නේ නම්, අනාවැකි සහිත ඇස්ට්රෝ-විෂන් ලයිෆ් සයින් ජ්යෝතිෂ්ය මෘදුකාංගය ගැන සොයා බලන්න. ලොව වටා රටවල් විශාල සංඛ්යාවක් සහිත දත්ත සංචිතයක් ඇස්ට්රොපැක් 1.0 සිංහල ජ්යෝතිෂ්ය මෘදුකාංග සතු ය. එනිසා සෑම අවස්ථාවකදීම අක්ෂාංශ දේශාංශ සහ වේලා කලාප ඇතුළත් කිරීම අවශ්ය නොවේ. එමෙන්ම නව රටවල් හෝ ස්ථාන ඇතුළත් කිරීමේ විකල්පය ද ඔබට ඇත. මෙම ඉන්දියානු ජන්මපත්ර මෘදුකාංගයේ ද්විත්ව විකල්ප වලින් භව බල තෝරා ගත හැකිය - පළමුවැන්න වන්නේ ආශ්රයෙන් නිර්ණය කෙරෙන බුධ වන අතර, දෙවැන්න වන්නේ බුධ, ආශ්රය නොසලකා හිතකර වීමයි. විශේෂ දීමනාවක් ලෙස, අපගේ සිංහල ජ්යෝතිෂ්ය මෘදුකාංගය සමඟ බෙහෙවින් ජනප්රිය පංචං මෘදුකාංගයේ, ස්ටාර්ක්ලොක් VX හි නොමිලේ පිටපතක් ලබා දෙනු ඇත. ද්විත්ව භාෂා ආකාරය, එනම්, ඉංග්රීසියෙන් මෙන්ම ඔබේ තේරීම අනුව කලාපීය භාෂාවන් එකකින් වාර්තා ලබා ගත හැකි වීම, ග්රහලෝක වල ගුණාංග නියෝජනය, එක් එක් අවස්ථාවේදී ජ්යෝතිෂ්යමය ගුණාංග, නියම රාහු කාල, ගුලිකා කාල, ග්රහතාරකාවන්ගේ සංක්රමණ වේලාවන් සහ සංක්රමණ ස්ථාන හඳුනාගැනීම සඳහා මෘදුකාංග, මුහුර්තම් මෘදුකාංග සහ පංචං දින දර්ශනය, පංචං මෘදුකාංග වලට ඇතුළත් විශිෂ්ට විශේෂාංග සමහරක් වේ. ඇස්ට්රොපැක් 1.0 සිංහල ජ්යෝතිෂ්ය මෘදුකාංගය මගින් උපන් වේලාවේ ග්රහතාරකාව මෙන්ම නක්ෂත්ර සහ වේලාපත්කඩයේ ජ්යෝතිෂ්ය ගුණාංග වැනි ග්රහතාරකා පාද, උපන් රාශිය සහ අධිපති රාශිය, උදාවන ලග්නය සහ ලග්නයේ අධිපති, තිථි (චන්ද්ර දිනය) සහ වෙනත් විවිධ ගණනය කරන ලද අගයයන් ගණනය කරනු ලබයි. යුරේනස්, නෙප්චූන් සහ ප්ලූටෝ වල ඇතුළුව ග්රහලෝක වල දේශාංශකය ගණනය කිරීම ලබා දෙන්නේ අපරදිග ක්රමයට අනුව ගණනය කිරීමෙන් ය. ග්රහලෝක වල නිරායාන දේශාංශකය, රාශිය, රාශියේ දේශාංශකය, නක්ෂත්ර සහ ග්රහතාරකා පාද ගණනය කෙරේ. එක් එක් ග්රහලෝකය සඳහා නක්ෂත්රය, නක්ෂත්ර අධීපති, උප අධිපති, උප උප අධිපති ගණනය කෙරේ. සිංහල ජ්යෝතිෂ්ය මෘදුකාංග තුළින් රාශි සටහන සහ නවාංශක සටහන සමඟ ග්රහලෝක වල නිරායාන දේශාංශක වල කෙටි සාරාංශයක් ද ලබා ගනු ලැබේ. රාශි සටහන සහ නවාංශක සටහන සමඟ උත්පත්තියේදී දස මෙන්ම දස තුලිතතාවය ද ලබා දෙනු ලැබේ. ඇස්ට්රොපැක් 1.0 සිංහල ජන්මපත්ර මෘදුකාංගය මගින් භව සටහන මෙන්ම අරම්බා, මධ්ය, ආන්ත්ය පිළිබඳ විස්තර සහිත භව වගුව සහ භව හි ස්ථානගතව ඇති ග්රහලෝක ලැයිස්තුවද ලබා දෙයි. අපගේ මෘදුකාංගය මගින් එක් එක් ග්රහලෝකයට අනුරූප උප-ග්රහලෝකය (උපග්රහ) ගණනය කරනු ලැබේ. චන්ද්රයා, සිකුරු, අඟහරු, රාහු සහ කේතු වල උප ග්රහලෝකයන් පදනම් වන්නේ සූර්යයාගේ දේශාංශකය මත වන අතර මෙම අගයයන් ද ගණනය කෙරෙනු ලැබේ. උප ග්රහලෝකයන් වන ධුමාදී සමූහය, එක් එක් ග්රහයා සඳහා උපග්රහයන් ගණනය කිරීමේ ක්රමයෙහි විස්තර සමඟ වගුවකින් ලබා දෙනු ලැබේ. උපග්රහ දේශාංශක ගණනය කර පහසුවෙන් බලා ගත හැකි වන පරිදි වගුවක ආකෘතියෙන් ලබා දෙනු ලැබේ. උපග්රහයන්ගේ නක්ෂත්ර අධිපති / උප-අධිපති / උප-උප-අධිපති සටහන් ද සකස් කර ඉදිරිපත් කරනු ලැබේ. උපග්රහ රාශී සටහන ගණනය කර සකස් කෙරේ. ඇස්ට්රොපැක් 1.0 සිංහල ජන්මපත්ර මෘදුකාංගය, අරුධ චක්රයට අනුරූප අගයයන් ගණනය කරනු ලබන අතර, සටහනක් සකස් කරයි. ඇස්ට්රොපැක් 1.0 සිංහල ජන්මපත්ර මෘදුකාංගය, ශෝධසවාර්ග වගුවේ තිබෙන අගයයන් ගණනය කර වගුවක් සකස් කරයි. ඇස්ට්රොපැක් 1.0 සිංහල ජන්මපත්ර මෘදුකාංගය, ශෝධස්වාර්ග හි අධිපතීන් ගණනය කර පහසුවෙන් බලා ගත හැකි වන පරිදි සටහනක් ආකාරයෙන් ඉදිරිපත් කරයි. ඇස්ට්රොපැක් 1.0 සිංහල ජන්මපත්ර මෘදුකාංගය, වාර්ගෝත්ථම ගණනය කරයි. ඇස්ට්රොපැක් 1.0 සිංහල ජ්යෝතිෂ්ය මෘදුකාංගය, වර්ග භේද අගයයන් ගණනය කරනු ලබන අතර, එහිදී ස්වවර්ග (තමන්ගේ නිවස) සහ උච්ඡාවර්ග (උච්චභාවය) සඳහා වෙන් කරනු ලබන ලකුණු ලබා දෙනු ලැබේ. අනුරූප වර්ග භේද වගුව ද සකසනු ලැබේ. ඇස්ට්රොපැක් 1.0 සිංහල ජ්යෝතිෂ්ය මෘදුකාංගය මගින් රාශි සටහන, හෝරා සටහන, ඩ්රෙක්කන සටහන, චතුර්තම්සම් සටහන, සප්තම්සම් සටහන, නවාංශක සටහන, දසම්සම් සටහන, ද්වදසම්සම් සටහන, ශෝධසම්සම් සටහන, විම්සම්සම් සටහන, චතූර්විම්සම්සම් සටහන, භම්සම් සටහන, ට්රිම්සම් සටහන, කාවේදම්සම් සටහන, අක්ෂවේදම්සම් සටහන සහ ශෂ්තියම්සම් සටහන වැනි අවශ්ය ගණනය කිරීම් සිදු කිරීමෙන් අනතුරුව විවිධ සටහන් සකස් කරයි. සිංහල ජ්යෝතිෂ්ය වැඩසටහනේ දී, විම්ශෝත්ථරී දස කාලසීමාවන් වල කෙටි සාරාංශයක් ලබා දෙනු ලැබේ. දස සහ භුක්ති (අපහාර) කාලයන් පිළිබඳ විස්තර ද, ඒ සමඟ ම එක් එක් දස කාලය තුළ එක් එක් භුක්ති (අපහාර) සඳහා, අරම්භා සහ අන්ත්යා පිළිබඳ විස්තර ඇස්ට්රොපැක් 1.0 සිංහල ජන්මපත්ර මෘදුකාංගය සතුව ඇත. එක් එක් පර්යන්තර්දස සඳහා අරම්භා සහ අන්ත්යා ඇතුළුව එක් එක් භුක්ති (අපහාර) තුළ පර්යන්තර්දස පිළිබඳ විස්තර, ඇස්ට්රොපැක් 1.0 සිංහල ජන්මපත්ර මෘදුකාංගය ඉදිරිපත් කරයි. ඇස්ට්රොපැක් 1.0 සිංහල ජ්යෝතිෂ්ය මෘදුකාංගය තුළින්, එක් එක් කොටුවේ අධිපතීන්, එක් එක් කොටුවේ භව අධිපති, ග්රහතාරකා පිළිබඳ සම්බන්ධය (යෝග), ග්රහලෝකයෙන් ග්රහලෝකයට ඇති ලක්ෂණ, හිතකර සහ අහිතකර ග්රහයන් සහ ඔවුන්ගේ බලපෑම්, ස්ථිර (නෛසර්ගික) මිත්ර සටහන ඇතුළුව මිත්ර සටහන, තාවකාලික (තත්කාලික) මිත්ර සටහන, පංච (පංචද) මිත්ර සටහන, ශෂ්තිතයම්සස් තුළ අංග ශක්ති සටහන (ද්රික්බල), ෂඩ්බල වගුව, ශෂ්තිතයම්සස් තුළ භව අංග ශක්ති සටහන ( භව ද්රික්බල), භව බල වගුව, කුජ දෝෂ පරීක්ෂණය, මෞද්යම් (දහන), ග්රහ යුද්ධ (ග්රහයන් අතර ගැටුම්) සහ ග්රහවස්ථ ග්රහතාරකා චරිත ස්වභාවය පිළිබඳ විශ්ලේෂණය මගින් ඉදිරිපත් කෙරේ. This astrology software suite is a combination of 4 different astrology software products available in Sinhala language.